It’s a good fit; the core Dachis Group principles of social business design fit well with the Sprinklr concept of social experience management. I’ll write more on the future later, but for now I’d like to take a look back. Over five and a half years, we built the world’s largest social business consultancy, completing six acquisitions, expanding to nine cities, and employing over 250 people. What a long, strange trip it’s been. We were successful in helping spark a global movement. In the beginning, we had to fight to win remnants of marketing and IT budgets. Today, businesses understand the need to shift into social business and have devoted hundreds of millions of dollars to prepare for the future. With the successful acquisition of Dachis Group, our part in the story of social business comes to a close and becomes part of a new emerging narrative. I learned plenty of lessons along the way about myself and others. About SaaS and services. About winning business, retaining business, and losing business. About founders and employees. About hiring people and firing people. About VCs and bankers. About spending money and saving money. About acquiring and being acquired. I don’t have stories about private jets and private concerts, but I do have plenty of direct experience in helping companies engage their ecosystems and become better prepared for business success in the face of the information revolution. Thank you to everyone who’s been part of the Dachis Group journey: our clients, employees, alumni, investors, business partners, and supporters-at-large. Jive Software and Dachis Group announce social business partnership. We’ll be working on initiatives over a multi-year period, which may include go-to-market product+service offerings. Given the deep base of Jive customers in the 2.0 Adoption Council, we already have a solid group of users in place who will benefit from this agreement. Enterprise 2.0 Conference kicks off in Boston. I like to think of this community as social business practitioners who have roots in the IT side of the house. My colleagues Dion Hinchcliffe, Susan Scrupski, Caroline Dangson, and Lee Bryant all have sessions this week. 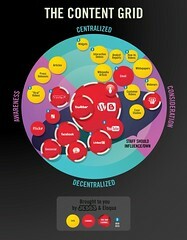 Eloqua shares its insight with The Content Grid. It’s a great way to think about corporate content marketing from communications ace Joe Chernov. I’m thrilled that Dachis Group’s growth and momentum continues with the acquisition of XPLANE, a visual thinking company. What does this mean? We have added a distinct set of capabilities to help clients diagnose the drivers of business problems and map out effective solutions. Their acumen in process design and change communication combines with our existing strategy formulation, program design, and technology implementation capabilities. If the style of graphics above seem familiar, but the name XPLANE isn’t, and you’ve been in the internet space for a while, you may have first encountered XPLANE’s work over a decade ago like I did on the pages of Business 2.0 magazine. These were the guys who illustrated how new concepts like group buying, e-commerce payment processing, and workforce collaboration models work. It’s one thing to read about a process; it’s another to actually see it illustrated. Dachis Group has been working on social business design for almost two years now and we have been putting pieces in place to boost our capabilities and reach, while completing innovative client engagements along the way. You can now find our over 100 staff around the world in five different countries, from our headquarters in Austin to Portland, St. Louis, Boston, Washington DC, London, Amsterdam, Madrid, and Sydney. To read more about the deal, here’s the press release. If you’d like to discuss how we can help your business, contact your nearest Dachis Group office. For more information, follow us on Twitter or subscribe to our Collaboratory updates.